Although researchers have been measuring unintended pregnancy for decades, the conventional approach to categorizing recalled pregnancy desires does not capture the complexities of women’s and couples’ desires, their experiences prior to pregnancy or the context in which a pregnancy occurs. As a result, sources of data available to characterize pregnancy desires and experiences are limited. The Guttmacher Institute is aware of these limitations, and our experts are working to address them in our work. The findings included in this fact sheet are the most current available. All other pregnancies are often termed “intended,” including those that were desired at the time they occurred or were wanted sooner than they occurred (“then or sooner”). At the national level, pregnancies to women who were indifferent or unsure about becoming pregnant are typically combined with pregnancies that were wanted then or sooner. It is important to note that women defined as having an “intended” pregnancy have not necessarily expressed an intention or plan to become pregnant. Understanding demographic differences in unintended pregnancy helps to identify where to focus policy and programmatic interventions, and highlights areas of inequality. These differences do not occur in a vacuum; they reflect differences in social, cultural, structural, economic and political contexts, which influence health behaviors, access to services and outcomes. 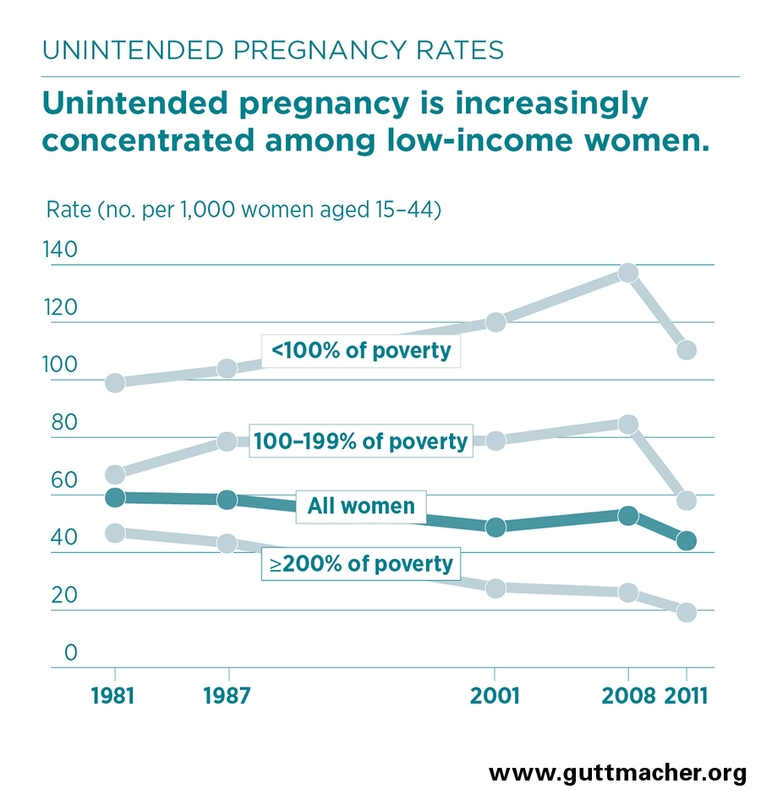 Unintended pregnancy rates are highest among low-income women (i.e., women with incomes less than 200% of the federal poverty level), women aged 18–24, cohabiting women and women of color.2 Rates tend to be lowest among higher-income women (at or above 200% of poverty), white women, college graduates and married women. 2. Finer LB and Zolna MR, Declines in unintended pregnancy in the United States, 2008–2011, New England Journal of Medicine, 2016, 374(9):843–852, doi:10.1056/NEJMsa1506575. 3. Singh S, Sedgh G and Hussain R, Unintended pregnancy: worldwide levels, trends, and outcomes, Studies in Family Planning, 2010, 41(4):241–250. 4. Finer LB, Unintended pregnancy among U.S. adolescents: accounting for sexual activity, Journal of Adolescent Health, 2010, 47(3):312–314, doi:10.1016/j.jadohealth.2010.02.002. 5. Finer LB and Zolna MR, Shifts in intended and unintended pregnancies in the United States, 2001–2008, American Journal of Public Health, 2014, 104(Suppl 1):S43–S48, doi:10.2105/AJPH.2013.301416. 6. Jones RK and Jerman J, Abortion incidence and service availability in the United States, 2011, Perspectives on Sexual and Reproductive Health, 2014, 46(1):3–14, doi:10.1363/46e0414. 7. Lindberg LD and Kost K, Exploring U.S. men’s birth intentions, Maternal and Child Health Journal, 2014, 18(3):625–633, doi:10.1007/s10995-013-1286-x. 9. Frost JJ et al., Return on investment: a fuller assessment of the benefits and cost savings of the US publicly funded family planning program, Milbank Quarterly, 2014, 92(4):696–749, doi:10.1111/1468-0009.12080. Source: Special tabulations of data from Finer LB and Zolna MR, Declines in unintended pregnancy in the United States, 2008–2011, New England Journal of Medicine, 2016, 374(9):843–852, doi:10.1056/NEJMsa1506575.